8/21/16: Two Husbands Down, One to Go! Lots of news to tell you about this week! 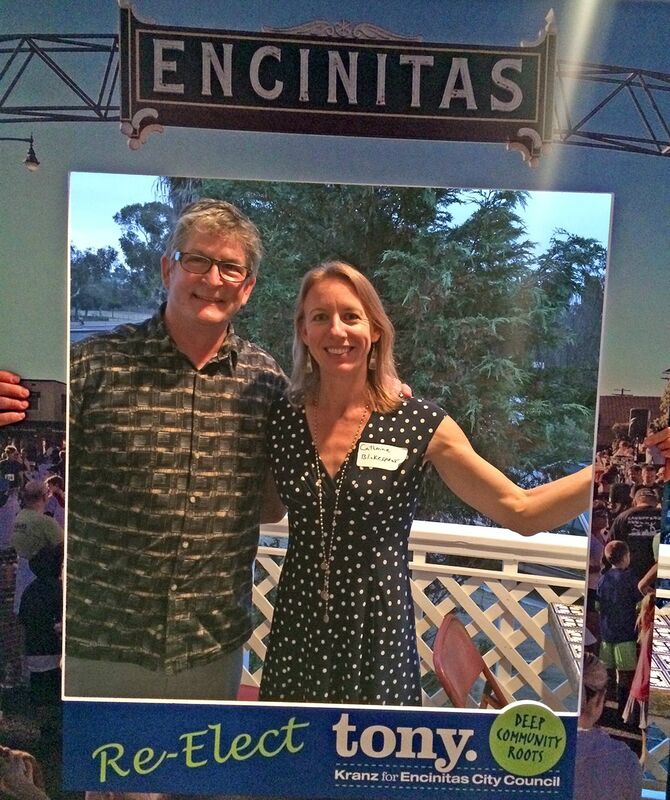 The filing deadline passed this week and now we officially have two candidates for Encinitas Mayor — the husband of Encinitas’ current Mayor, and me. Articles from The Coast News and San Diego Union-Tribune include quotes from the two husbands of elected women who picked up nomination papers, but decided not to run. I’m grateful for the endorsements from Steve Bartram (Council Member Lisa Shaffer’s husband) and Don Barth (former Mayor and Council Member Teresa Barth’s husband), who both know firsthand what effective, local representation looks like at the city level. 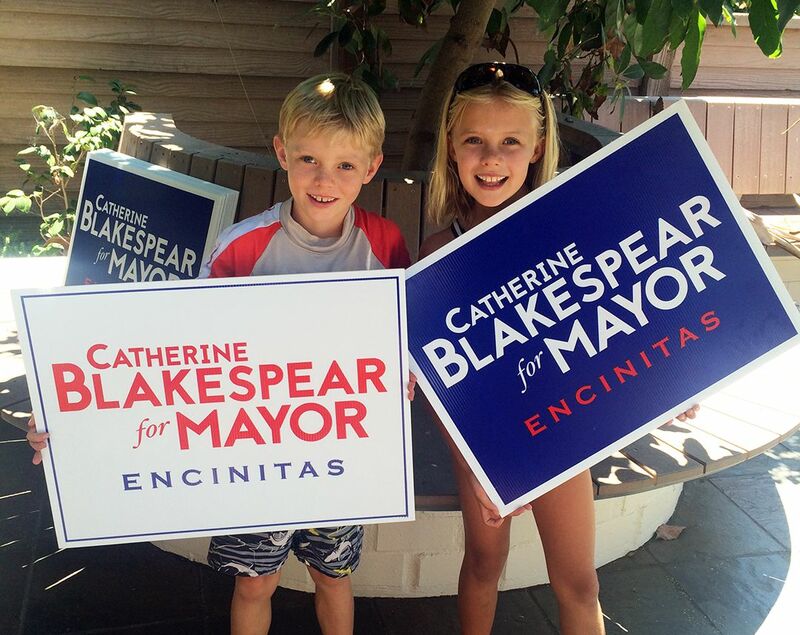 Our campaign is going strong, and our new “Blakespear for Mayor” yard signs have just arrived! Please click here if you’d like a free yard sign to display (we’ll even deliver it to you). Another homegrown candidate, Tony Kranz, kicked off his City Council campaign with a packed party and fundraiser at the Pannikin this week. Tony is an integral part of our City Council’s success, and it’s very important that we enable him to continue accomplishing great things. I fully support his re-election to the Encinitas City Council for a second four-year term. 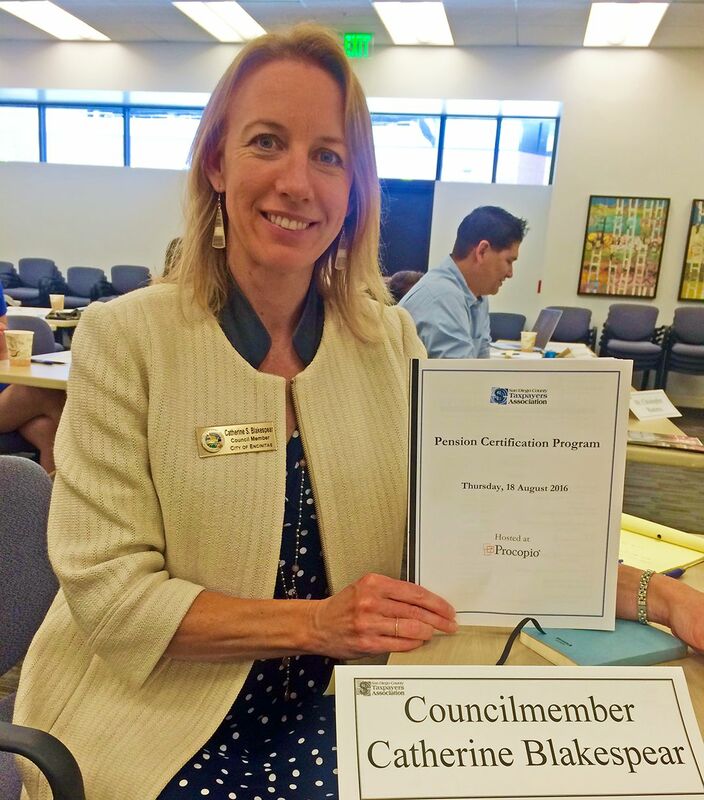 • The City Council turned down a proposal to permanently rename the Encinitas library in honor of a local philanthropist in exchange for a $1.5 million donation to the city and a $500,000 donation to the Friends of the Library. This Encinitas Advocate article explains our rationale for this decision, along with the strange circumstances in the City Council chambers that surrounded our deliberations. In advance of the meeting, we received hundreds of emails, both strongly for and against the renaming. • We approved permit parking for Seacrest Way, Seaview Court and Pacific View Lane, and amended the staff recommendation to allow residents of the nearby Essex Apartments to be allowed to secure a $5 parking permit, as well as those living in single family homes. • The City Council approved the ballot argument that Deputy Mayor Lisa Shaffer and I drafted for the Housing Element Update. An opposition argument will be written and then both sides will write their rebuttals. • We decided to wait until a state bill regarding the formula for rounding on base housing density passes the California Legislature before acting on our local ordinance. As you may recall, I traveled to Sacramento to advocate against AB 2501, a state bill that will result in higher density developments, and will limit the ability of cities to critically examine developments before approval. Unfortunately, that bill continues to move forward, with an expected approval on the floor of the full state Senate very soon. Despite this regrettable news, my testimony in front of a committee resulted in an important contact with another opponent group from the Bay Area. After hearing my testimony, an advocate working for an affordable housing group called me to discuss an economic argument in opposition to the state bill, which formed the basis for this letter of opposition that we drafted. It’s important to understand the level of government at which decisions can be influenced, and to make connections that could lead to improvements in our local community. Although this particular bill continues to move forward, I’ve begun the important work of influencing these and future decisions. • The Coastal Mobility & Livability Working Group will hold its second meeting on Sept. 7th at 6 p.m. I’m extremely proud of this group, which I believe is a model for public engagement in the city. All of the city’s established stakeholder groups have one seat on the committee, and the first meeting of the group drew a large crowd of interested residents. This broad-based group will advise on the future of our rail corridor and surrounding areas and issues — including parking, drainage and mobility in general. By way of comparison, most of our city commissions have between zero and five applicants for any open position, while this group drew 46 applicants. In a bizarre development, the leadership of the No Rail Trail group is currently refusing to fill its seat on the committee, while publicly attacking the working group’s membership and aligning with my mayoral opponent. The original perspective of No Rail Trail was to emphasize and give voice to the value of keeping open space in the rail corridor. The motto on their shirts is “Keep it Natural.” This perspective deserves to be officially represented. If no one fills the seat by the next meeting, I intend to suggest that we solicit from the public again for a representative to officially participate in the working group. I believe there are a large number of people who aren’t interested in the gamesmanship and finger-pointing, and would rather just get to work collaborating on the future decisions in the rail corridor and throughout the city related to mobility and parking. As for the status of the rail trail through Cardiff — the Council and SANDAG are working together to secure an amendment from the Coastal Commission to allow the section through Cardiff to be built on Highway 101. Our city’s long-term fiscal health is of the utmost importance. We have an excellent finance director, but elected officials and especially the Mayor need to be as knowledgeable as possible about the intricacies of our future financial obligations. To deepen my knowledge base, I attended an 8-hour Pension Certification Program this week hosted by the San Diego County Taxpayers Association. They presented excellent, high-quality material. Tasha Boerner Horvath, another Encinitas City Council candidate, also attended. Tasha has been instrumental in critically evaluating development proposals as a member of the Planning Commission, demonstrating her work ethic and community-oriented perspective. She also has my full support this November. 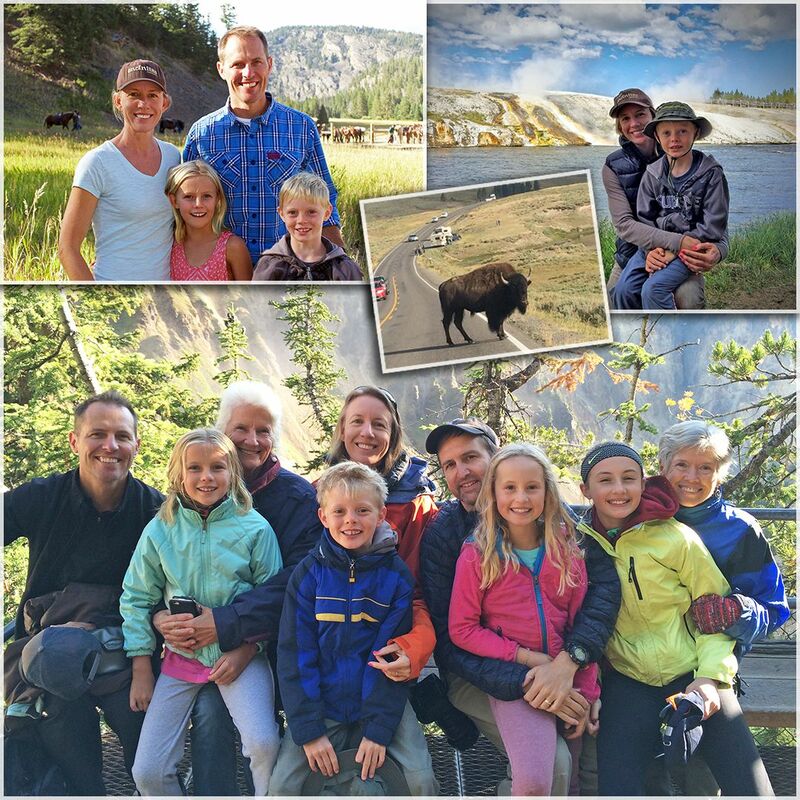 The Blakespear family, together with our cousins, traveled to Yellowstone National Park earlier this month, where we marveled at the integration of wildlife with the land. The geologic activity that creates the geyers, hot springs, and paint pots, together with the bisons, bears and wolves, makes it no surprise that the Yellowstone area was designated the world’s first National Park in 1872. My husband Jeremy is a former Park Ranger who worked at Yellowstone and other national parks, and it was his commitment to this magical place that resulted in our vacation here during the centennial year of the entire park system.